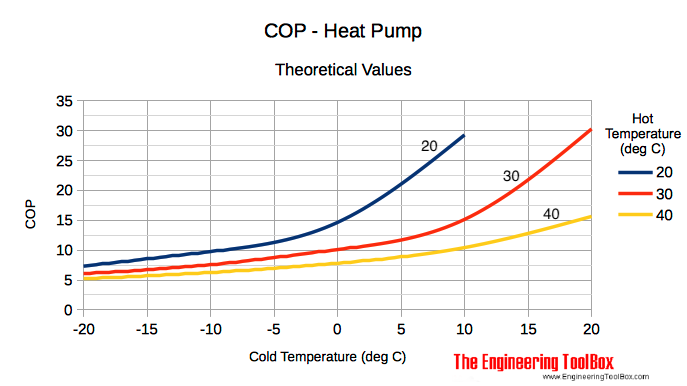 The Coefficient of Performance - COP - is the ratio of heat output to the amount of energy input for a heat pump. Note! - the efficiency of a cooling or heating process can be increased by reducing the temperature difference (Th - Tc) between the hot and cold side. A heating process with a lower hot temperature - like achievable in a piped floor system - will increases the efficiency compared to a system with higher hot temperature - like a heating panel system. 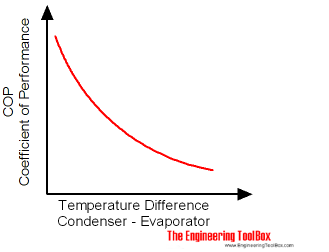 The opposite for a cooling process - a lower cold temperature will increase the efficiency. The typical practical value for a heat pump is in the range 2 - 4. The Energy Efficiency Ratio - EER - is a measure of the cooling efficiency of a heat pump. The Heating Season Performance Factor - HSPF - is a measure of the overall heating efficiency of a heat pump during the season. The HSPF can be regarded as an "average" COP for an entire heating season. It is common to compare BTUs of heat output to watts of electrical energy input. HSPF of 6.8 can be compared with an average COP of 2. A HSPF in the range of 5-7 is acceptable. Seasonal Energy Efficiency Ratio is a measure of the seasonal cooling efficiency of a heat pump or a consumer central air conditioning system. The SEER should be at least 13 to be sold in the United States. SEER above 20 is a very efficient system. Engineering ToolBox, (2008). Heat Pumps - Performance and Efficiency Ratings. [online] Available at: https://www.engineeringtoolbox.com/heat-pump-efficiency-ratings-d_1117.html [Accessed Day Mo. Year].